The canoe might be the finest vessel ever built for the traveller. In a canoe you can explore slowly and intently, just like walking or cycling, but from the water you see everything from a new perspective. The landscape takes on a certain freshness. My first trip in a Canadian-style open canoe was on the Royal Canal in 2015, paddling slowly from Enfield to Mullingar over three days. 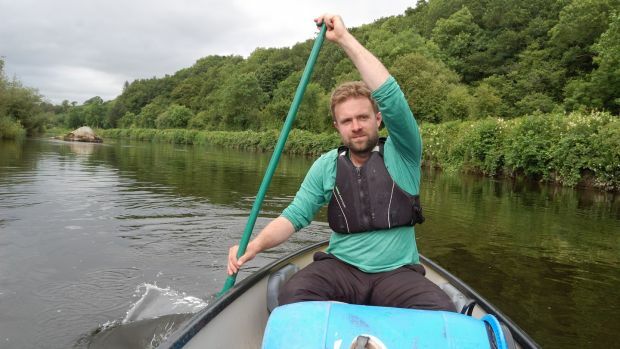 Then I canoed the Barrow and Upper Lough Erne, each time camping along the way. 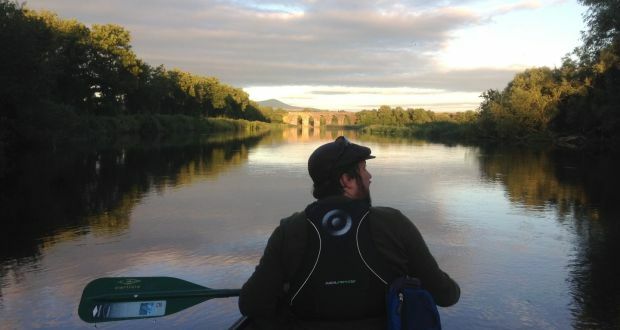 This summer, I return to the Barrow, the best of Ireland’s big rivers. On a breezy bright evening, my friend Dan and I meet Charlie Horan of Go With The Flow River Adventures – who’s been guiding on the Barrow for 20 years – in Bagenalstown, Co Carlow. Horan gives us a canoe, paddles, waterproof barrels, buoyancy aids, helmets and sets us on our way. We pack the boat with camping gear, spare clothes, food and wine and launch into one of the Barrow’s many side-canals. We bring the boat through a lock and out on to the river, then paddle on under the Royal Oak road bridge and the high arcs of a railway viaduct. As the wind eases, the setting sun casts the river in pale oranges and purples. The still air above the water thrums with flies and midges, and bats come out to feast. At Slyguff, we make camp in the dusk by a ruined lock house under beech trees. A family is eating dinner in a barge just above the lock. Later, when I knock and ask if they could boil some water for us – to my horror, I’ve brought the wrong camping gas for my stove – they offer us hot goulash, then invite us in for whiskey. Dan and I drink ours straight, our new German friends prefer theirs with Coke. Through broken English, they tell us that they come boating on Irish waterways every summer. They have barely explored the west coast, but know the midlands intimately. And they are taking it even slower than us, planning to travel just four kilometres the next day. We sleep well and wake early. With no fuel to cook, we eat chocolate and get back on the water, paddling in the morning silence. We pull in at Goresbridge, Kilkenny, a sleepy little village. The only cafe is closed, so we raid the local shop for croissants, chocolate, fruit and coffee. “What’s going on in the world?” I ask Dan, who is looking at the papers. When canoe touring, you shed your normal concept of time. Instead, your day becomes a slow rota of activities that anchor you to the present moment: you wake, make coffee and breakfast, break camp, paddle a while, stop for lunch, paddle some more, make camp, cook dinner, have a nightcap, sleep. In 1783, work began on a waterway to link the Grand Canal with the Barrow. This canal, the Barrow Line, stretches through Kildare from Robertsown to Athy, where it meets the river proper. From Athy south to St Mullins, the navigation follows the Barrow and a series of side-canals built to bring boats around shallow, rocky stretches of river. Weirs were built to provide sufficient water for each side-canal. Experienced paddlers might choose to shoot the weirs and the rapids below. Newbies should take the canals, which means either bringing the boat through a lock if you have a key, which is slow going, or portaging around (carrying the boat), which is hard work. We get back on the water as the grey day warms up. Below Goresbridge, the Barrow is a revelation, winding south through endless forest. Down on the water, the skyline is nothing but fir and larch, willow and ash. This is the Barrow’s beautiful deceit. The riverside woods might only be tens of metres of deep, but in your canoe you have no way of knowing. So where woods overhang the river near Borris estate, the Barrow feels so wild and empty you could be a voyageur exploring the waters of deepest Quebec. Horan tells me that when guiding on this wondrous stretch of the river, he asks his clients to be totally quiet, just to experience the silence. At Borris Lock we stopped for lunch in the close heat. Dan spots a young buzzard perched deep in the woods, as one of its parents shrieks overhead. Travelling with Dan, a skilled naturalist, is an education. He points out the whooper swan loitering for the summer when most had returned to Iceland, the jays calling from the woods, the sparrowhawk circling overhead. He tells us the woods fronting the river are known as gallery woods, and that one bird call we hear is a great-spotted woodpecker – a species that has only recently recolonised Ireland. Graiguenamanagh, Co Kilkenny. A perfect stop off for a trip a down the Barrow. Later on, the clouds burn off and the evening sky turns blue. 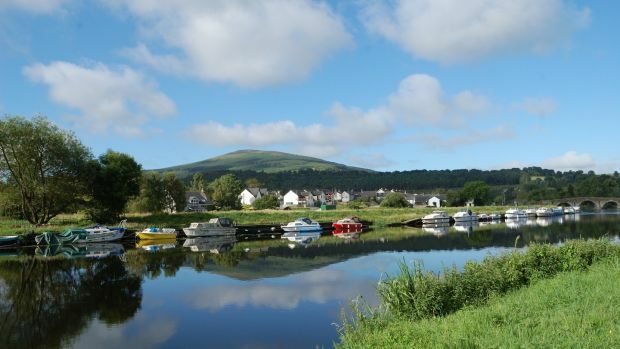 We paddle into Graiguenamanagh and set up our tents on the grassy riverbank above the village. We walk up the town’s pretty, curving main street, have dinner in the Chinese and walk around historic Duiske abbey. We climb up to a terrace of Tudor-revival style “widow’s cottages”, built around 1850 by the local landlords for “indigent widows” according to the plaque, as dusk comes over the valley. Then we make our way back to the tents, but slowly, via three pubs. Kilkenny have just beaten Limerick in the hurling, and the town is buzzing, the main street thronging as cover bands and disco lights fill the bars and locals ease from pub to pub. The next morning is bright and still. Back on the water, the morning is hot as we paddle on under the forested slopes of Brandon Hill. The valley grows deeper, the trees seem taller. At Carriglead Lock a sign outside the lock cottage protests plans to turn the grassy towpath into a cycling greenway. We paddle down the long canal to St Mullins Lock, where barges and cruisers sit, some half-sunk and forgotten. This is where the Barrow Navigation ends. We tie up the canoe and walk the kilometre downriver to the Mullicháin Cafe, situated in an elegant old riverside grain store. From here south, the river is under the pull and push of the tides. This is also where the towpath ends. There is talk of extending the planned greenway south of here, where the valley becomes deep, wild and inaccessible. And while I’m sure there are good economic reasons for doing so, there are other good, less tangible reasons, for doing nothing at all. The cafe is buzzing, the riverbank thronged with people sunbathing in the heat. After a big lunch we get back on the water; our car is back in Graiguenamanagh. We launch the boat for one last paddle back up river as the white sun beats down on this wild little world. The calm, sheltered waters of the river Barrow are ideal for your first canoe touring trip. “There are very few waters in Ireland where a compete beginner can just take off,” says Charlie Horan of Go With the Flow River Adventures. Go With The Flow offers self-guided and guided tours, from one night to week-long trips. You can start from as far north as Monasterevin in Co Kildare, or any of the towns and villages down along the river, many of which are accessible by train and bus. Go With The Flow is offering a special deal of €99 per person for a weekend self-guided canoe trip, from Friday to Sunday. Horan can provide tents, or organise B&Bs or luxury accommodation along the river.